There is a strong dependence between temperature and power in circuits. High temperatures and extreme power levels are large sources of error. Until now, two separate operations were needed for the simulation of these processes. For the first time, nanoCOPS has successfully combined the two steps into one, speeding up the simulation significantly and delivering much better results. 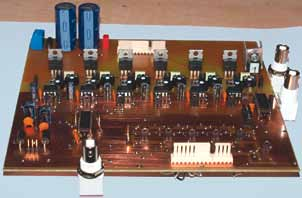 Among other things, the product ptm-ET from MAGWEL calculates the computed dynamic currents of Joule self-heating in metal and active area, heat flow models in chip and package, and supports thermal planning and non-linear temperature-dependent models. It provides self-consistent solution of electrical and thermal equations in 3D solver. Thanks to nanoCOPS, MAGWEL now provides a field-solver based with a specification to microelectronics. The uniqueness of ptm-ET is the faithful handling of nonlinearities that are present in the physical properties of the material and equations. 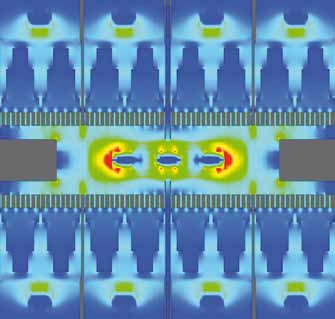 The Max Planck Institute Magdeburg has developed Parametric Model Order Reduction (PMOR) methods for Electro-Thermal (ET) simulation, especially for being used together with the simulation tool ptm-ET. These methods simulate a real and original circuit in a smaller model, which makes much more extensive simulations possible. The accuracy and efficiency of the proposed PMOR methods are validated by both simulation and uncertainty quantification based on reduced-order models. A unique feature is that even temperature-dependent parameters and non-linear, quadratic functions are integrated into a common simulation. Another theme is the coupling of electromagnetic fields with circuits. This field is becoming more and more complex. Unlike all previous suppliers of simulators, the tool developed by nanoCOPS can now simulate not just individual components in 3D, but also the circuits. Another difference is that non-linear materials such as semiconductors can be integrated directly into the simulation. With the MAGWEL program Device-Electro-Magnetic Modeler (devem), all kinds of disturbance can be simulated. To date, this graphical approach is unique and allows a much faster detection of errors. 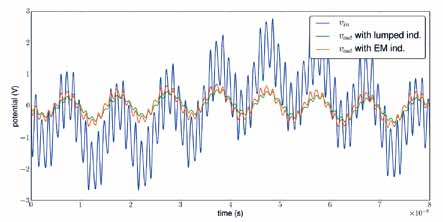 The UQ-library provides uncertainty quantification by creating a response surface model based on an expansion in orthogonal polynominals. NXP, the University of Wuppertal and the TU Eindhoven have developed a special algorithm for fast fault simulation in NXP&apos;s in-house circuit simulator. For this functionality, this simulator is the current market leader. 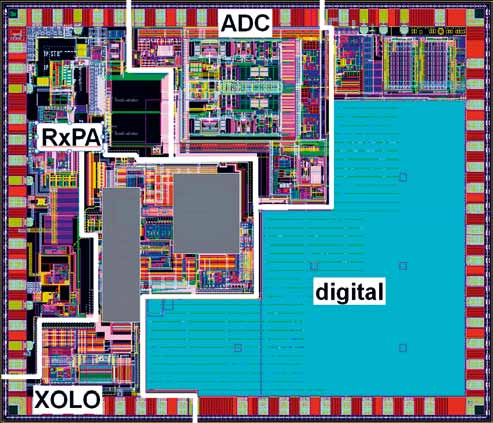 NXP can identify locations on a chip that are probably affected by limited manufacturing accuracies that cause faulty behaviour at predefined time points for measurements. Inclusion of sensitivity analysis brought accelerations in CPU time of a factor 20 or more. In the manufacture of metal parts, there is inevitably uncertainty and error involved. In this field, research is about how strongly and in which way the performance of a transistor is dependent on and affected by this uncertainty. Different voltages cause different structures. This results in very high temperatures which can lead to the failure of the transistor. For the first time, the work of nanoCOPS has provided a model that reveals the dangers and also leads to an improvement of the metal carrier. This allows for a significant reduction of heat generation. In order to analyse the ageing process, circuit devices and boards are tested in a temperature cabin at different temperatures ranging up to 180°C. In order to avoid a destruction of thousands of circuits for testing, new models have been developed by TU Darmstadt in cooperation with Brno University of Technology, ON Semiconductors and MAGWEL for test bond wires. The measurements show that a fused bond wire does not mean an immediate open loop. Various degradation processes have been intercepted by the delayed time base feature of the oscilloscopes. When designing bond wires for the packaging of integrated circuits as shown in the left Figure, engineers are left with various design parameters. 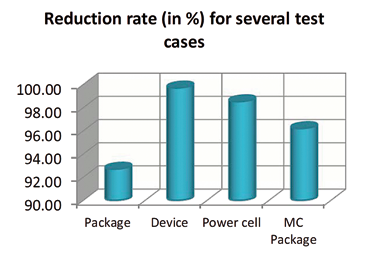 There is a tradeoff between minimal cost and maximum performance. Moreover, the thinner the wire, the higher the probability of failure (breaking) during operation. Bond wire calculators allow to estimate parameters based on simplified models. In nanoCOPS, an improved bond wires (as in title) model was developed and included in Magwel&apos;s electrothermal field simulator. By this, the overall behaviour of chip and bonding wires can be reliably analysed in the design phase. It was mathematically shown that the coupled model preserves important principles such as energy conservation. Finally, in combination with the tools from uncertainty quantification, failure probabilities, as shown in the right Figure, can be precisely estimated. 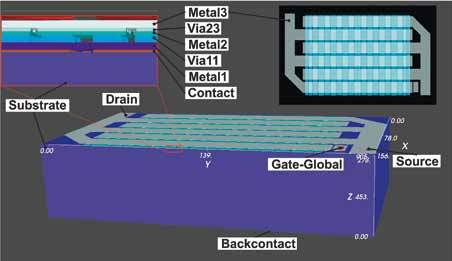 Eventually, cheaper and more robust integrated circuits can be designed. Many field simulations can be carried out efficiently using dedicated tools, like Magwel&apos;s PTM-ET for electrothermal problems. However, some problems require an export of the model, e.g. 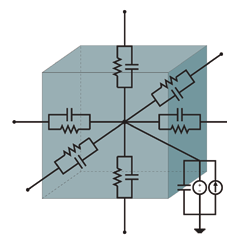 for additional postprocessing or coupling to surrounding circuitry. For those cases, nanoCOPS developed an algorithm for the lossless extraction of nonlinear equivalent electro- thermal and electromagnetic netlists from 3D field models as constructed by PTM-ET. In this algorithm, apart from the spatial discretisation of the fields, neither simplifications are applied nor it is limited to particular circuit simulators. 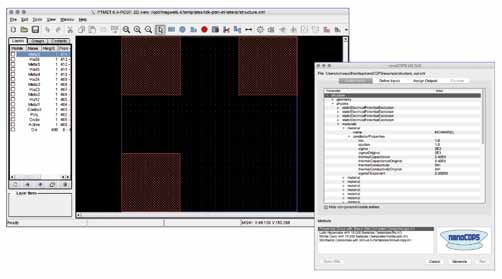 Within the nanoCOPS project, a beta version of a graphical interface was designed, implemented and added to MAGWEL&apos;s software suite. The interface is built upon Sandias Dakota library for uncertainty quatification and allows an unique user experience: relevant statistical data is gathered and the impact of tolerances and random distributions of design parameters on quantities of interest are computed without further user interaction. To speed up simulations, the hybrid algorithm by Li, Li and Xiu for rare failure probabilities was implemented and made available to the industrial partners. The required number of simulations for the quantification is thereby reduced from several 100,000 to several 100. 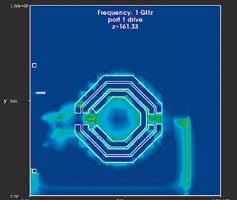 Modular structure of the holistic circuit/electromagnetic field solver PyCEM The Python integrated Circuit/EM environment PyCEM provides the opportunity to solve coupled circuit and EM equation systems in one holistic framework. The essential advantage is the robustness of the holistic approach. The violation of certain contraction conditions may lead to serious convergence problems in co-simulation approaches. The holistic approach usually leads to reliable solutions. The holistic approach with a unified time step control is new and unique for circuit/EM couplings. The FHO in-house simulator LinzFrame follows a strict modular concept. Moreover, it comprises an automatic differentiation suite which simplifies the implementation of new models significantly. It allows that partial derivatives with respect to the state variables do not need to be coded, but are computed automatically. 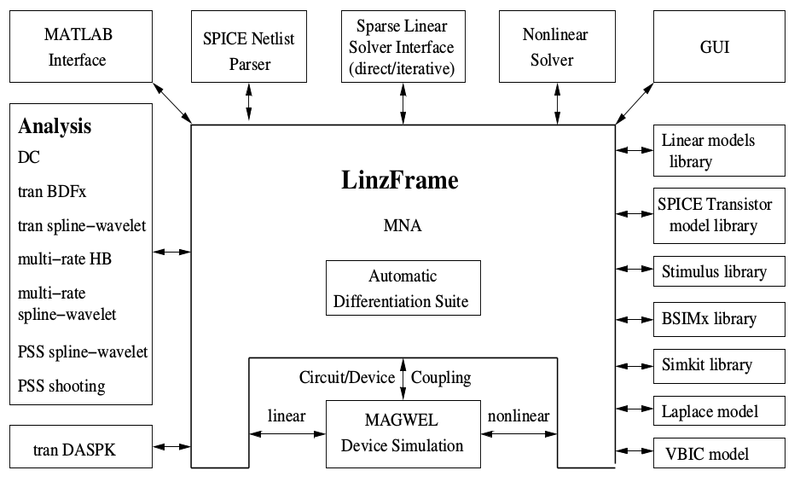 Model libraries for linear devices, SPICE tran- sistor models and a stimulus library including modulated sources, libraries to industry relevant device models and the Simkit library from NXP are available. A Laplace model interface, which allows the incorporation of compressed models from MOR, complements the model libraries. The analysis tool comprises standard methods such as DC, AC and transient analysis with polynomial and trigonometric BDFx (MBDFx) methods, an interface to the DASPK simulator for solving higher index differential algebraic equations (DAEs), and a spline-wavelet transient simulator. Several tools for multi-rate simulation Harmonic Balance (HB), BDF and spline- wavelet techniques are incorporated. Periodic steady state (PSS) methods for driven and autonomous circuits such as oscillators complete the tool. A holistic coupling with an EM/device simulator enables mixed-level circuit/ electromagnetic simulation.